Over the last 40 years, Hertz Furniture has become the premier source for school furniture. We know nothing is more conducive to a successful learning experience than a properly thought-out and well-equipped classroom. In the first part of this two-part article, we’ll start with a review of our basic classroom chair. The color and design of the typical classroom chair may vary (for example, some have triangular slats, some vertical, some ovular, etc.) but the basic classroom chair is made with a polypropylene shell. Polypropylene is a fancy word for plastic, sometimes referred to as “soft” plastic. This is in contrast to classroom chairs made of “hard” plastic. “Soft plastic” does not mean it is soft like a cushion, but rather that it is soft enough to “give” a little if you lean back in it enough. This is the chair you see in the vast majority of classrooms in the United States and around the world. At Hertz Furniture, we call it our 120 series; they start with the prefix “ACD” — and include the ACD-128, ACD-126, ACD-124 and ACD-122. The Poly-Shell Chair is an example. If you have students that might be rougher than usual on the furniture, a hard plastic chair is a good choice. It is made of harder material, has no “give,” and is more durable. 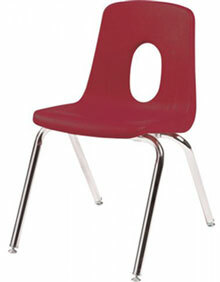 Our hard plastic chairs begin with the prefix “HPC” — and include the HPC-518, HPC-516, HPC-514 and HPC-512. The Extra Heavy Duty Hard Plastic Chair is an example. The height in this case is measured from floor to seat. Generally, you and I and everyone from fourth grade and above sit on seats 18 inches off the ground. Note that some chairs come with options for adjustable heights and even wheels (called casters), but those are usually reserved for teachers or special situations. A final, but very important consideration in school chairs is color. Navy and burgundy are the most common colors in classroom chairs, but you’ll find them in other colors such as red, yellow, green, teal, blue, black, etc. Color is an inexpensive way to set the atmosphere of the classroom. Here is a tip for school administrators: it’s a good idea to ask your teacher what color she thinks would work best. If you are looking for something unique and inspiring, there is a third type of chair offered exclusively by Hertz Furniture— the Inspiration line of classroom furniture. Both Inspiration chairs and desks have a unique shape and come in a variety of colors, setting a truly creative atmosphere for your classroom that will help your students tap into their true potential. After all, students are all individuals with special talents. You want their classrooms to look and feel good so they can be inspired to succeed. And when it comes to Hertz’ Inspiration line, beauty is more than skin deep. Not only does the classroom furniture look good, but it is extra-comfortable and extremely strong. The legs, for instance, are 14-gauge steel—stronger than the average school chair. Combining form and function, Inspiration is sure to enhance your students’ creativity and inspire them to achieve heights above the norm and out-of-the-box. If you have any further questions or you'd like assistance in finding classroom chairs that will best suit your needs, feel free to contact a Hertz Furniture expert at 888-793-4999, or by chat between 9am-5pm EST. Also, see Classroom Furniture: Desks and Tables.